I have been getting high temperatures with my videocard. It reaches 82°C in a matter of minutes running the MSI kombustor furmark. Having read countless reviews 2 years ago before I bought this card, this is not normal. It should stay around 60°C and never exceed even 70°C. I have not overclocked it, it's running at factory overclock. It stayed under 70 degrees 2 years ago, though. Didn't really keep track of the temperatures, but I recall it slowly increasing. Perhaps the age of the card just makes it run hotter and hotter. This is how it has always been. When I loaded up kombustor, it reached 83 degrees in 2 minutes. Now I decided to clean up my pc since my new fans arrived today anyway + I got a can of compressed air. Cleaned every part of my computer, including the GPU. Using the same fan configuration, nothing has changed, reached 82 degrees in a more than 2 minutes, but still too hot. Miniscule improvement, though. After that I decided to change the thermal paste. With the same config, it dropped another degree, still above 80, too hot. I then changed my configuration to Side: 200mm exhaust. No change. After that I removed the side panel, but it still is hot. 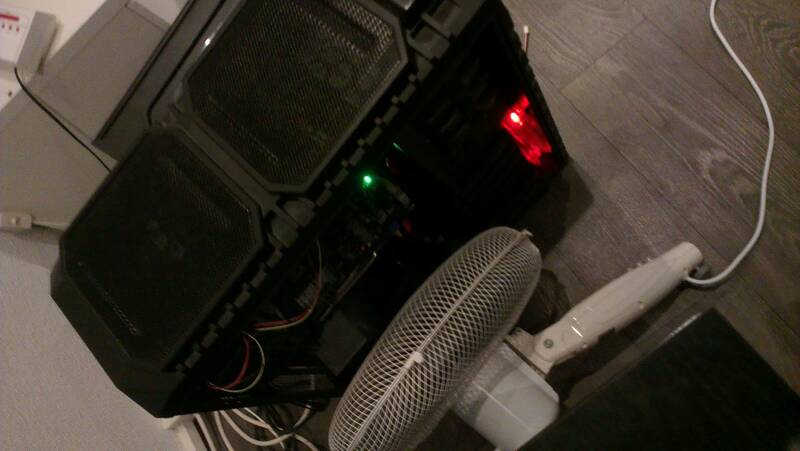 Then I decided to put a real fan next to it blowing air on the components. The temperatured then lingered at 76-77°C. Still too hot. My room temperature is normal too, don't know the exact degrees, but I assure you it's normal. 2. Cleaned PC. Problem persists. 3. Applied new thermal paste. Problem persists. 5. Put a real fan next to it. Dropped to 77°C, so problem still persists. Changing the thermal pads I think won't be needed, since the GPU runs hot and the VRM and Memory have normal temperatures. I hope there is a solution to this problem, or I have to live with it. Last edited by BFighter; July 29, 2013 at 03:35 PM. Do you know if the last time you checked was winter? Maybe the temps have not changed but you only checked your winter temps... Was it cold in your room when you checked a few years ago? Don't worry about the temps,80c or lower is good,especially for fermi ,and it won't damage your card if you keep it under 80-85c. Would probably shorten lifespan by a few months if you keep it at 85c 24/7 but 77c is great. Last edited by bliz; July 29, 2013 at 03:20 PM. And that ofcourse isn't a good solution. All tests are run with the kombustor, the real furmark somehow crashes my pc when I press a button. Edit: I'll play some BF3 to see what happens. Well, that was fun. With fan config with the Side as intake the max temp was 66°C while playing BF3 multiplayer 64p @ ultra settings 4x msaa (everything maxed). Played like 40mins. What kind of heatsink is on that? Does it have heatpipes? If so, maybe one or more of your heatpipes has lost integrity and thus isn't providing any cooling. Have you considered trying an aftermarket cooler? It's a twin frozr 3 heatsink and I didn't no. Edit: I'm afraid if I buy one it still doesn't work and then I lost a lot of money. And the twin frozr 3 is one of the best out there. Last edited by BFighter; July 29, 2013 at 05:22 PM. Did you verify that both fans are actually spinning @ full speed under high temps? I had issues with my 560ti twin frozr cards where both fans were spinning, but one was only making a half added attempt to get up to 100%.